I am of the belief that the best password is one that you don't even know yourself. One that is so long and complex, that if someone had a gun to your head you couldn't recall it to save your own life. That is why I like to use Last Pass as my password vault. I only need to know one password to get in, but the rest can be 30 character randomly generated passwords that even I don't know. Last Pass is great if a computer is handy, but what if one is not? What if you need a super secret password and you don't have access to a computer? I found a tool for you, that not only will allow you to make secure passwords no matter where you are, computer or not, but is also in itself a two factor authentication method as well. It's called a Password Chart. Here is one I came up with using the pass phrase, "I love Bauer-Power." See how I got that? Picking and remembering strong passwords is a pain. It's easier to convert an easy to remember one. It works anywhere on any computer. It also works offline if you print out the chart. Its free, easy and secure. Everything is done in your browser -- no passwords are sent over the Internet. Like I said above, this is also two factor authentication. Two factor authentication in this case is something you have and something you know. The thing you have is the chart, and the thing you know is the simple password that you will convert to a strong password using the chart. A bad guy would need both the chart and your password to break the code. If you ever lose your chart, you can re-generate it using the original pass phrase you used to generate it in the first place. Also, you can take it with you by printing it out, which means you can use it everywhere. 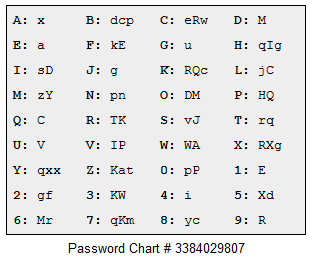 What do you think about this method for creating passwords? Like it? Know of something better? Let us know in the comments.